On Saturday, the Wanaka Garden Circle had its spring festival. 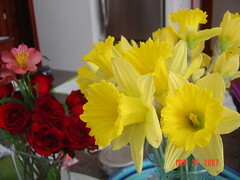 For $5 we were able to admire the fresh blooms from local gardens as well as partake in a delicious afternoon tea. Pikelets with homemade jam and cream. Fruit loaf. My children gorged themselves. My son told me there were 115 different daffodils on display. A perfect afternoon event to go to with Nana.